Brew Riot 2013 is taking place May, 19 2013 in the Bishop Arts District, and with more than 60 home brew teams signed up it’s sure to be one heck of a party! We’re expecting a hugh crowd this year, so we recommend you read the information below and buy your tickets in advance. The fun kicks off with the 2nd annual 1.1 mile beer run, which starts at Nova Restaurant (1417 West Davis) at 3:30pm and proceeds down 7th Street with 3 beer stops before the finish line in Bishop Arts. If you plan to participate in the 1.1 then you MUST register in advance. The cost is $35 and that INCLUDES your admission into Brew Riot as well as the ever popular 1.1 sticker for your car. Tickets for the 1.1 are available via PreKindle – click here! Runners need to be at Nova by 3pm and the run will start at 3:30pm. If running isn’t quite your bag, then go ahead and purchase your ticket in advance for Brew Riot. The cost is $20 and this gives you the opportunity to sample all of the home brews and vote for your favorite. There’s some amazing beer being poured this year, and odds are good that many of these home brew teams are your next local commercial breweries. Four Corners Brewing Co. got their start at the very first Brew Riot, and look at them now! Pre-sale tickets for Brew Riot are available viaPreKindle – click here! The beer starts flowing at 4pm and will be served until teams run out and we crown a People’s Choice Champion of the 5th Annual Brew Riot. In addition to beer we’ve also got a great line up of live music, including The O’s, The Birds of Night and Hunter Jones! Today we got our first entries! Thank you for your interest in the Bishop Arts Brew Riot and Homebrew Competition! Our 5th annual Brew Riot will be held Sunday, May 19, 2013, on N. Bishop Avenue from 4 to 8 pm. Homebrewers will be checked in at 2 pm. Register online by May 5, 2013. The fee for entering is $20.00. This contest is open to all amateur home brewers who brew less than 200 gallons of beer, and is restricted to non-commercial, home brewed beers. All brews being entered for Panel Judging will need to be bottled, labeled, and delivered to a designated location by May 12, 2013. Labeling directions and drop off addresses will be emailed to you by May 1, 2013. In the event that you cannot drop the bottles off, a mailing address will be provided. Judging results will be announced at the festival at 7:30 p.m. on May 19. 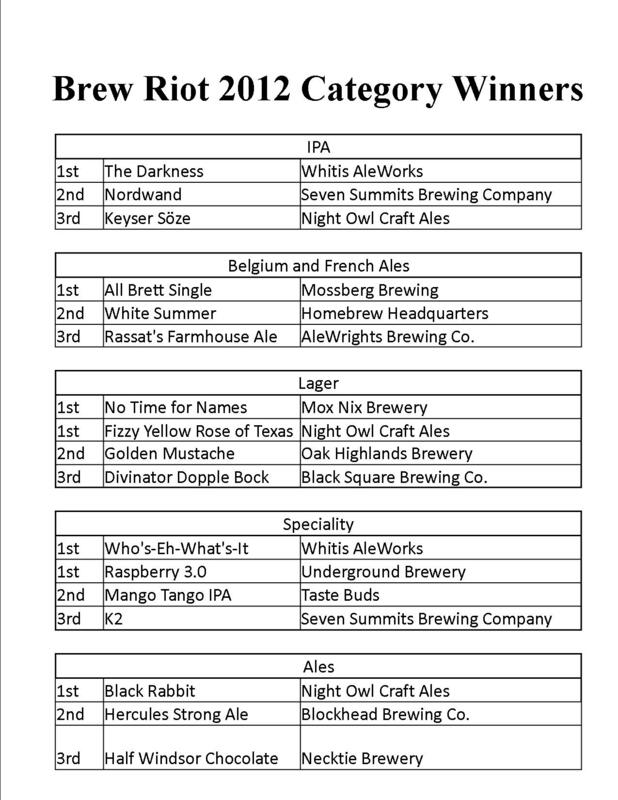 Brew Riot is produced by Go Oak Cliff, a 501c3 organization.